The pictures of the Sinai fire tragedy that are circulating on the internet are so graphic that they come with a warning and you need a strong stomach to be able to view them. I’ve been reeling ever since I was sent the pictures that I dared not see to the end. I just couldn’t take it and deleted the email completely because I was really stunned and shocked to the core. We all know what happened and then the blame-game starts. There were different opinions being splashed all over social networks like Facebook and especially Twitter. ‘Kenyans Will Never Learn’ seemed to be a trending topic and I asked myself which lot of Kenyans will never learn? Are we sitting in the comfort of our homes in a position to criticize the people who wanted to gather up fuel, not caring for their lives because they probably felt deep down that a five litre mkebe of fuel will have more value than their life? Unless you have been in the throes of poverty you cannot call a poor man stupid for looking for any means of trying to feed himself or his family. It is his frustration that drives him to resort to risking life like that. And then again this week we saw the same thing happening at Busia. Kenyans rush to try and get fuel but end up losing their lives or getting severely burnt and needing urgent medical attention. It is so easy to shake our heads and say Kenyans will never learn. 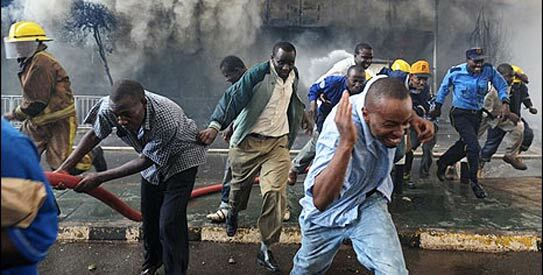 Has anyone stopped to think why these Kenyans risk their lives in the first place? Is it their fault that they live in abject and extreme poverty? If you’re at this point thinking I’m going to have a field day cussing down the Members of Parliament for being the most overpaid and under-worked species of our country, you’re wrong. I think we’re all fed up of the same rant over and again because no one ever listens. We’re all like a bunch of silly stubborn children who want everything done our way but don’t want to work hard for it. And the ones who are working hard have got hardly anything to show for at the end of the day. Times are tough. The rate of the dollar leaves us gasping in its vice like grip. Fuel prices have shot up, food is expensive, just basic commodities cost you so much and if you’re not earning a regular salary at a high end job, you’re most definitely struggling to make ends meet. School fees, utility bills, basic living expenses are not cheap at all. In India there have been talks this week to bring down the poverty line. In Kenya we seem to be doing nothing at all. Appropriate noises are made every now and then but no one seems to get up and actually do anything about it. The story is the same everywhere. We’re fed up and tired and crave change. We want to see poverty under control where our fellow Kenyans will not risk life and limb over a few litres worth of fuel.